These have been coming up all over the place recently, a nice spec 7 inch Windows tablet, let down slightly by only 1GB RAM (though still perfectly adequate and functional). This was a Black Friday deal but is now listed again as a Christmas deal, it appears to be ongoing for now at least. And it is the cheapest it has been by £20, but would likely not qualify for the £30 cashback for trading in an old tablet. Still the best deal if you don't have a tablet you value at practically nothing that you want to trade in. Price down to £59.99 again! This price has changed quite a lot so don't put it off much longer as it might go back up and stay there. Insane price. I would have thought it was a con but it's from a good ebay seller. It's a Black Friday price until Monday.That's why it's cheap. 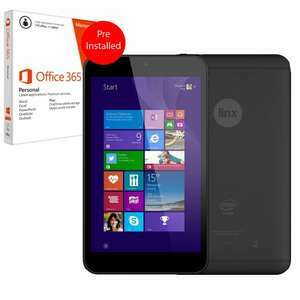 Awesome price for 7" full windows tablet and bundled with office 365 makes this essentially a free tablet! Bought and not one bruise gained. Are there any good reviews? I could see an unboxing video on youtube, but no others. Can these be hooked up via hdmi to a TV and powered by the TV's USB? If so, connect it to a bluetooth keyboard and mouse, it could be a low running cost PC / TV setup. Saw the price and caved myself, then checked here and surprised it wasn't already posted. Supermarket deals that I have seen online have been a bit disappointing so far so glad I didn't go down my local for the mass panic. I would have posted the Bluetooth Watch for £25 but it is unbranded. I have bought one of those as well, it appears to be a cheap one from China that is imported, the same watch (by appearance at least) sells on AliExpress for £25-£35 from most sellers, with a couple down to just over £20 right now, but still £25 from a UK seller is good. can you plug a 3/4 G dongle or mifi device into these ?? Looks like you can't get the trade in offer. Linx7-No-Trade-in - Linx7 32GB Tablet, Intel Quad Core Windows 8.1 FREE MS Office 12mth Subscription"
Still an amazing price for this tablet had been considering it for a while now and took the plunge! just ordered and also mailed all my friends. thinking if getting 2 but may just stick with one. are there any reviews for these tablets? Could see only some unboxing videos on youtube but no reviews as such. Is that not the standard price for the 8" anyway ? Nice price!, I want but I don't need it. I have a Surface Pro 3 and a Nexus 7, but why do I feel I'm missing out? ordered would be criminal not to at this price. Can anyone tell me about this £30 trade in? Do you have to pay for the office after 1 year? Is the os the desktop version ? are there any reviews for these tablets? Could see only some unboxing … are there any reviews for these tablets? Could see only some unboxing videos on youtube but no reviews as such. Do you have to pay for the office after 1 year?Is the os the desktop … Do you have to pay for the office after 1 year?Is the os the desktop version ? Yes standard 8.1 with Bing. It will run any x86 software. Anyone know the difference between this and the one at £82.50?, the only difference I can see is that this refers to 12 month Office 365 whereas the same version at £82.50 refers to "free" Office 365, am I missing something?, which is the best deal? I bought the 10" version from Insight Uk for £174, but this included the origami keyboard/case. I am awaiting my box from them to trade in my Advent Vega 10" for £50, so 2gb/32gb/win 8/HDMI out tablet for £124. HDMI is full HD and my 10" powers a portable HD no problem. Really pleased with it and the CS from Linx who got back to me on queries really quickly. This v Android 7" is no comparison, it's a full Win 8 tablet. Anyone know the difference between this and the one at £82.50?, the only … Anyone know the difference between this and the one at £82.50?, the only difference I can see is that this refers to 12 month Office 365 whereas the same version at £82.50 refers to "free" Office 365, am I missing something?, which is the best deal? They all come with 1yr free subscription to Office 365, after that you pay for it. Does anyone know if yan you run skygo through a browser for this? Looking to hook it up to a TV via the HDMI. If only the 8" had £20 off as well I'd be all over it. I just think the 7" would be too small for Windows. Heat anyway OP ! Yes I believe you can. Saw it in a different thread on these tablets the other day. It's basically a pocket laptop with all the same functionality !